The end of the school year is upon us. I squeezed in three visits in the last few weeks, two to schools in New South Wales, Bunghwahl and Forster ,and one in Victoria at Dunkeld. All were memorable and it was a great way to finish the year. The enthusiasm of the students is a great energiser and over and over the staff at each school told me how much the program contributes to the life of the school and the differences it has made in so many ways. 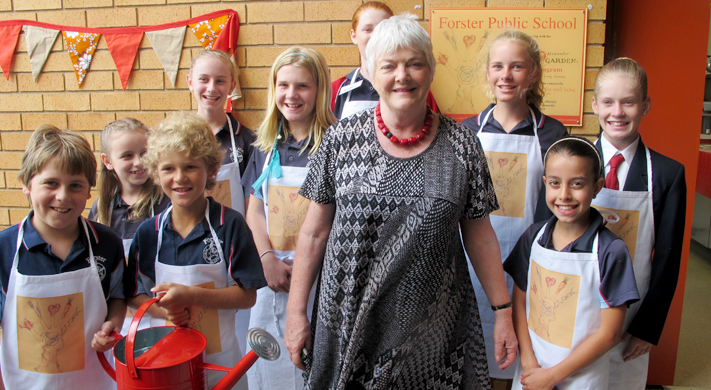 We were welcomed to Forster (the largest of our schools in New South Wales with over 700 students) with a smoking ceremony, and a performance by the choir before a tour of both the extensive garden and the just-completed kitchen. A delicious morning tea had been prepared by the students and I tucked into hummus, various vegetable dips with grilled flatbreads, zucchini fritters with mint yoghurt and the most refreshing Lemongrassade. One of the enthusiastic supporters of the kitchen garden, parent Amanda , surprised us by delivering a huge basket of local produce to our accommodation. Freshly-harvested oysters, freshly-caught snapper, salad greens, herbs, a lovely local cheese, some chocolates and a vase of home-grown roses. And special teas and cereals for breakfast. So special. We sat on our balcony enjoying our banquet and listened to the soothing sound of the ocean slapping on the sand. The next morning we visited tiny Bunghwahl as a complete contrast with just 42 students. Once again we were warmly welcomed and we admired the very pretty garden where Nikki Dixon is both the kitchen and the garden specialist. 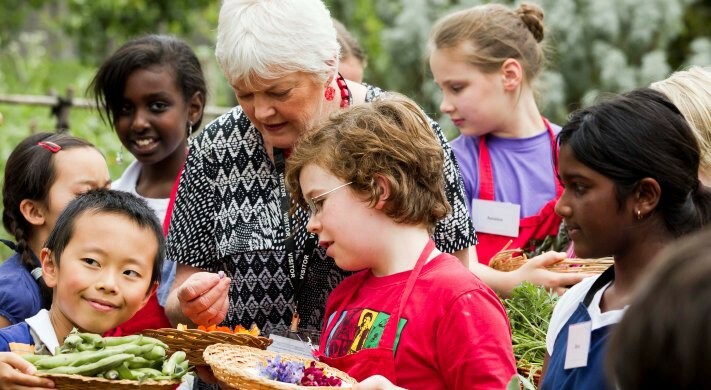 She proudly led the tour of both the garden and the kitchen and told us a very funny story of how one morning the students found a possum sitting on freshly-laid eggs, and being very reluctant to allow anyone to collect the eggs. She has a wonderful photo to remember that incident. We watched an extraordinary display of the entire school population as they ‘Jumped rope for Heart health’ from the tiniest prep student to some very tall sixth graders. And again we had a lovely lunch of stuffed eggs (from the chickens), leek tarts, home-made yoghurt, beetroot salad and a leafy salad . Both New South Wales schools included semi-tropical crops in their garden such as bananas and pineapples and lemongrass and chilli bushes. I went to say Happy Holidays to our Kitchen Specialist extraordinaire Desley Insall at Collingwood College and her Wednesday team of volunteers, most of whom have been coming every week for nearly nine years. I couldn’t stay for long but I left with a gift of honeycomb from suburban Surrey Hills, brought in by Jill, one of the star volunteers, whose husband tends hives in their garden. How delicious it was, the honey flooded my mouth with sweetness and perfume. I had forgotten what freshly-harvested honey tasted like. This was an important reminder. And then I launched the program at another small school, at Dunkeld with towering and imposing Mt.Sturgeon in the background. The project has been embraced by the whole community, many of whom have signed on to a watering roster to care for the garden over the long school holidays. Irrigation will be installed in the new year. The children have all adopted a tree in the extensive orchard and accept the responsibility for caring for this tree. Lunch included a rosemary and potato pizza, a lovely salad with roasted pumpkin, green leaves, seeds and cauliflower, some parsnip crisps and a raspberry muffin. On each table was a big bowl of locally-gathered blackberries – donated by someone in the community, as well as bunches of country flowers that were absolutely beautiful. I returned to Melbourne, ready for some downtime myself but feeling happy , knowing that our schools are forging ahead and that all that the Foundation does is truly appreciated. 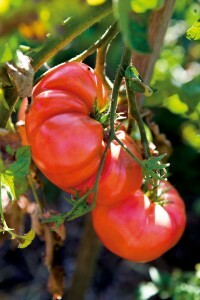 An excerpt from ‘Stephanie’s latest’, first published on the Kitchen Garden Foundation website. The full text is available here. It is such a busy time in the garden, cleaning up after the last of the brassicas (although I still have sprouting broccoli to pick) and planting out eggplant, sweet peppers and zucchini or squash. And of course basil. Every available bit of free space in my front beds is taken up with magnificent self-seeded lettuce. Even though I share with my friends it is impossible to eat it fast enough. I am still waiting for my beans and cucumber to start growing strongly up the bamboo tepees I have waiting for them. Like all gardeners I have been delighted by the great rain we have had over the last few weeks. One downside is that the snails in my garden have taken over my empty bamboo teepees for their own personal gymnasium. I am disposing of them ruthlessly. As always the last few weeks of the year seem to start speeding up and here we are nearly at the end of another school year, and already deep in planning mode for 2012. We hope that every school has a water plan to carry them over the vacation so that students will return to a bumper harvest. We may be in for a hot summer this year so all gardeners will be thinking of the best way to protect their gardens over the long holidays. Mulch, mulch, mulch I hear you all say. And maybe some of the fruit trees should be netted to frustrate the birds. Some schools will have some crops ready to pick just before going on holiday. It is rare for any berries to make it to the kitchen – the perfect treat to enjoy in the garden. But maybe cherries or early apricots or nectarines, or even a first crop of tomatoes. Fruit can be poached and the chunks frozen, or it can be turned into a purée, or bottled. Tomatoes can be cooked to make a very fast tomato sauce, which is a fabulous resource to come back to. Once again the messages we are promoting have proved irresistible to a wide range of media and many schools have featured on television and in print. I have spoken to a very wide range of audiences. But the most pleasurable moments in my year have been visiting schools and watching and listening to the students. Enthusiasm, excitement and pride in achievement are what I see and hear, wherever I go. Summer is a time of bounty in the garden and our long evenings encourage gatherings of friends. My yellow pole beans have reached the top of their two metre stakes in a week! My frilly lettuces are soft and luxuriant. 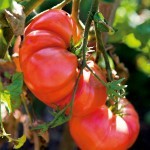 Get out those recipes for tomatoes, zucchini, cucumbers, beans, chili and eggplant. Summer is the moment for fruity dessert. Do ask around – and maybe you will discover that a neighbour or a friend has a backyard tree or a passionfruit vine dripping with more fruit than can be used. Here are a few of my quick ideas for summer platters. Cherries with fromage frais and a crisp biscuit; simple fruit tarts with the fruit settled onto a layer of lightly sweetened smooth ricotta; upside-down cakes with plums, or peaches, or pineapple; halved stone fruit, stones removed, drizzled with orange juice and a bit of brown sugar and baked; chilled watermelon with torn mint and a few drops of rosewater; fruit salads with scooped passionfruit added to the mix. I hope your gardens are dripping with beans and basil and beetroot, and that your tomatoes are growing strongly. There is stunning buffalo mozzarella for sale in markets at the moment. Ripe tomatoes, mozzarella chunks, torn basil leaves, sea salt, freshly ground pepper and a good drizzle of extra virgin olive oil has to be one of the all-time great summer lunches.